. 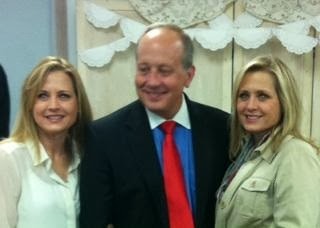 I was only 20 months old when Terri and Sherri were born--the first twins in the county in decades. Knowing there would be many visitors, friends and family to see them, my folks took remarkably insightful action. They were a gift and referred to as David's babies. When visitors came to see these beautiful blonde, blue eyed identical twins and asked to hold them or to take pictures, my folks would inform them that they would have to ask me. "Ask David. They're his babies." So, all the attention directed toward them was diverted to and through me. My folks were brilliant. For most of my life I have been known as the twins' brother. The twins were more talented, gifted, attractive and popular than I ever was. At home though, my parents' gift to me became a great source of good-natured fun. When they appealed to dad for permission to go somewhere or do something, they were often referred to me for a final decision. "Ask your brother. You belong to him," was a statement that would often exasperate the twins and caused me no end of delight. And can you imagine the frustration they experienced when they had to ask me permission to date? I should note that when their respective beaus proposed to them, both twins made them ask both my dad and their big brother for permission. 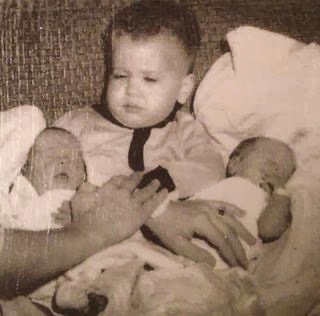 Fifty years later, I'm still the twins' brother and they're still David's babies. Happy birthday Terri Whitlock Willms and Sherri Whitlock Chronister.